The Bank of England has cut its 2015 growth forecast from 2.9% to 2.5%, and for next year from 2.9% to 2.6%, as governor Mark Carney unveiled his quarterly inflation report. And it backed expectations interest rates may rise in about a year's time. Mr Carney also said deflation could emerge during the year, but that inflation was expected to pick up notably towards the end of the year. Inflation was 0% in March for a second month, well below the Bank's 2% target. The figure marks the lowest rate of Consumer Prices Index inflation since estimates of the measure began in 1988. The Bank's base rate has been at a record low of 0.5% for more than six years. 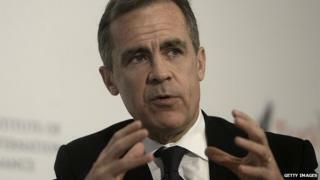 Mr Carney blamed falling inflation on a sharp fall in energy prices, lower food prices and strong sterling. He said these factors explained about three-quarters of the fall in inflation. However, the Bank's governor said he was relaxed about the low inflation rate and said the factors which had driven it to zero would be "relatively short-lived". "A temporary period of falling prices should not be mistaken for widespread and persistent deflation," he said, emphasising that the economy was growing and that there was no evidence household spending was being delayed. He said inflation should return to its 2% target within two years before rising slightly above this. Just to remind you of the point of all this soothsaying by the Bank, the Governor Mark Carney sees inflation rising back to the 2% target over the two-year policy horizon. That is based on market expectations that the interest rate it sets will finally rise from the current 0.5% rate to 0.75% some time between April and July next year. So interest rates to rise in roughly a year. You have been told. The Bank also downgraded expectations for wage growth in 2015 from 3.5% to 2.5%. Meanwhile, Mr Carney warned of "underlying weakness" as the Bank gave a gloomier picture for productivity growth. The Bank revised down its productivity forecast because it sees a disproportionate number of new jobs as low-skilled and low-output. Productivity growth is now expected to improve only modestly in the coming year before remaining below past average rates. "Today's report should leave nobody in any doubt about the fundamental role of productivity growth in the UK economy's performance," said Aberdeen Asset Management chief economist Lucy O'Carroll. "The Bank of England has downgraded its growth outlook, and Mark Carney has put poor productivity right at the centre of the story. "He may have put part of the productivity disappointment of recent years down to a disproportionate pick-up in low-productivity jobs, but he has also admitted that underinvestment has played a role. He's right." Mr Carney also warned that "persistent headwinds continued to weigh on the UK economy", which would mean more gradual increases in interest rates than previously. "The Bank of England's latest inflation report supports financial markets' (and our own) view that the MPC [Monetary Policy Committee] is in no rush to raise interest rates," said Vicky Redwood, chief UK economist at Capital Economics. "This suggests that the MPC sees the market expectations on which the forecast is based - for interest rates to start rising in the middle of next year and reach just 1.25% by the end of 2017 - as broadly correct."